A routine scan reveals the presence of a ship that should not be there. Another excellent episode of Bodacious Space Pirates (Moretsu Pirates) — Now that the voyage of the Odette II is under way, some mysterious things start happening, including the sighting of a Ghost Ship, one that is supposed to have been destroyed for over a hundred years. Besides the cool factor of introducing a ghost ship, this episode did two very good things: it maintained its careful pacing, and it started filling us in on the other characters. Chiaki Kurihara, left, rational and deliberative. 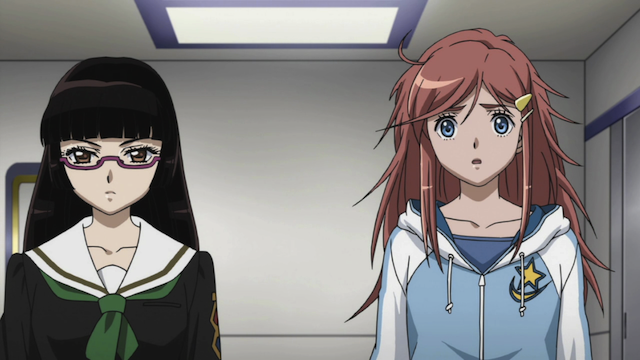 Marika Katou, right, intuitive and decisive. I didn’t spend much time on the various characters in my first post on this series, but another shift, in which Chiaki and Marika are scheduled to work together, shows that these characters have some of the dynamics of a classic combo, Spock and Kirk. Chiaki is prepared with an assortment of facts, and has a cool veneer that can seem condescending. Nevertheless she shows clear admiration at times for Marika’s confidence and intuition. Together they make a great team, Chiaki keeps Marika’s intuitive enthusiasm from becoming mere sloppy recklessness, and Marika’s intuition and decisiveness keeps Chiaki’s careful deliberation from resulting in paralysis. From left to right: Jenny Dolittle, President of the Space Yacht club; Kane MacDougall, club faculty advisor; and Misa Grandwood, ship's doctor. 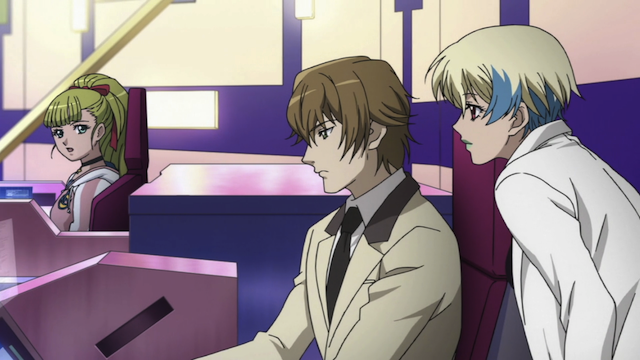 Kane and Misa, being secretly members of the space pirate ship Bentenmaru, are probably the two characters we are most familiar with outside of Marika herself. This episode brought the revelation that, not only had the pirates bugged the bridge, so they could monitor Marika’s decisions, the club president, Jenny Dolittle, had bugged the faculty communication lines, so their faculty advisors could be monitored. In fact, Captain Dolittle actually knows all about Marika’s relationship to the Bentenmaru, which is, of course, the likely cause behind the mysterious events they have detected. Jenny Dolittle and Marika Katou discuss battle plans. So far I find all three of these characters likable. Jenny, for example, is willing to accept Marika’s situation as soon as she admits to her situation. 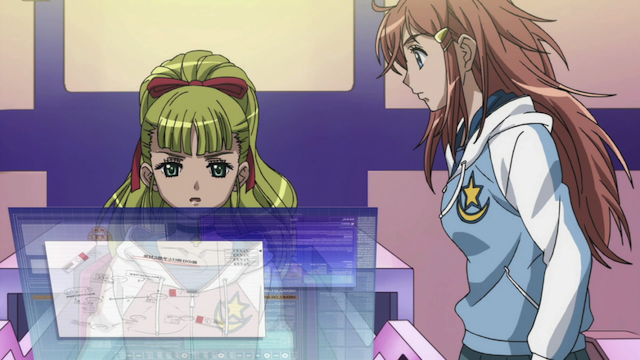 She encourages the others in the crew to accept it as well with a very common-sense, “Because of some stuff with her family, bad guys are after Marika.” She asks Marika what she thinks they should do, but won’t accept the recommendation to fight without confirmation that it is grounded upon something. Meanwhile Kane-sensei gets serious cool teacher points for knowing that the students he is responsible for watching over are willingly walking into a fight (with a mysterious ghost ship, no less), but choosing to support them by feigning ignorance. Odette II with solar sails unfurled. One more character that has really come alive in this show is the Odette II. It doesn’t have an AI voice, so I don’t mean character in that way. 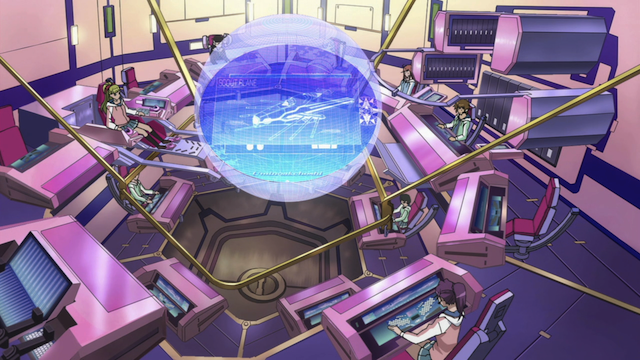 Instead, the show’s hard Science Fiction approach means care has been put into developing the ship so that the design and the systems are consistent and credible. We have previously been introduced to the solar sail and mast systems, as well as the electronic warfare system. This time there was a lot of information about various external monitoring systems (I think “radar” would be too precise a term). A view of the bridge. Note the split-level design. everybody faces each other, as if they are participating in a group discussion (which, they no doubt are). In addition to their private stations with individual displays, there is a large central display that is shared by the team. Also note the hatch on the bottom, which leads to the central corridor that runs the length of the ship. Without diving into the weeds, the crew finds a ship that appears at times on some external observation systems, but not all, and not all the time. Further, Chiaki has noticed an anomalous pattern that suggests someone is jamming the signals the Odette II is receiving (and those they can send). When Marika switches on the weapons locking system (a risky move), she gets a return signal indicated she has found a ship that disappeared 120 years ago. Together Marika, Chiaki, Captain Dolittle, and the rest of the crew prepare for what looks like an up-coming ambush. Great stuff! I’m sure people are still out there complaining about the pace, but they are wrong. Some people, after episode 3, stated that at least this first part was over, and we could now move on to the Bentenmaru. They are wrong. This show is doing a great job of building a compelling sea yarn set on a space yacht manned by high school girls. And, since I haven’t linked to the OP yet, here it is. I find it pretty amusing. It is a bit of a combination of something Ali Project would do (particular in the beginning) and then more traditional J-Pop. Enjoy! I’m REALLY enjoying this show so far. It’s doing a great job of giving a believable depiction of ship operations while avoiding a lot of techno-babble. Most of the science here is well-grounded, if presented somewhat fancifully. And I like how they’re keeping the show light without being silly. Even as they’re going into what could be a dangerous situation, the actions of Kane and Misa seem to indicate that the situation is more under control than might at first seem to be the case. Right now, I’m most curious about Chiaki. She’s obviously on a mission…but from whom? Is she working for another faction, or on her own? She doesn’t appear to be allied with the Bentenmaru people, but does seem supportive of Marika. How many more actors are involved here, and how many layers are there going to be to this story before all is said and done? There are definitely secrets to be revealed here. Yummy! That really surprises me about this show. I thought it had a high chance of being too silly and frivolous, but it never went there, and yet it has kept a light, enthusiastic tone all along. Chiaki is no more a coincidence than Kane is, but I can’t figure her out either. I like Jenny, but the two teachers really annoy me. They’re just so detached from everything and unemotional. They always smile. You should never trust people who always smile. They sound so coy when they talk too, especially the nurse. Well, to be fair, the two teachers are dissembling. They haven’t come clean with most students about being pirates, and even Marika has been lied to, since Kane told her he was only there as a coincidence. So I agree that they are hiding things behind the smiles, but I think it is that they are protecting Marika on behalf of (and with the cooperation of) the Bentenmaru. Or I could be full of balloon juice. That’s an interesting theory. They certainly have some dry powder at the ready with the Bentenmaru. It will be interesting to see what happens. That’s a very interesting theory, I think you may be onto something. By “detached” though I didn’t mean only with the ghost ship, but about how they treat people in general, including each other. During all of their conversations with each other, they are smiling and chatting happily. Their interactions just seem kind of fake. I would like some more clarification of their relationship. Kane told the class that he is married. Is he married to Misa? I think between the two, Kane actually does show some emotion, so I wouldn’t call him detached. For example, he sighs and grimaces in this episode. But I agree that I haven’t seen Misa without a smile on her face yet. Yeah, I was wonderig if those two might be hitched to each other. They seem to have that long-married couple vibe. I do see your point droggie, but it also occurs to me that the director may be trying to make a point about the particular sub-culture of the privateers. It’ll be interesting to see how these two react when the shite hits the fan (as it inevitably will). The same kind of easy-going nature was evident in the townspeople in “Shingu” — one of this director’s other works — and he was DEFINITELY trying to make a point there. So we’ll have to see how that’s handled as the story progresses. It’s also true that we haven’t seen anything really bad happen when they were around. The mast malfunction was certainly a time to keep a cool head. The only time I think something really serious happened was when someone attempted to kidnap Marika, and we didn’t see the pirates until the situation was under control. It will be interesting to see what happens in the next episode, since it looks like a real battle of some sort is about to break out. 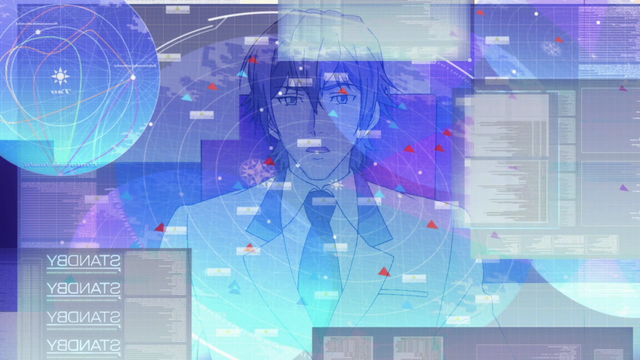 This show’s ‘science’ is like Steins;Gate’s ‘science’ – externally impressive, but internally a mess. You have trained, professional hackers trying to hack into a ship, but they get repelled by… what? An antivirus system, that’s what! How can they call themselves hackers if they’re repelled by a simple, commercially available antivirus system!? Marika and Chiaki didn’t even do anything! The whole concept of solar masts makes sense (and is much better than if the ship actually had giant masts), but why would they deploy the masts on all sides of the ship? Why would they need solar panels anyways? They’re so close to the sun; why wouldn’t they construct a perpetual ring around the sun, and then transmit energy to every ship? I mean, immense amounts of energy were needed to bring a /planetful/ of people over to the Sea of the Morningstar, so they obviously have the technology to harness massive amounts of energy. When you look at it, the ‘technology’ in this show would’ve been woefully outdated. A century has passed since the planet rebelled against the Galactic Whatever Society, and millennia would have to pass before such a Society could even be created. Are you seriously telling me that people still use cars, bikes, textbooks, final exams, hologram displays, and solar panels in such an age? Because by the holy Mother of God, we already HAVE these advanced technological gadgets RIGHT NOW. We don’t need THOUSANDS OF YEARS to develop them! We’ve advanced, in less than TWO HUNDRED YEARS, from inventing the first STEAM ENGINE until now, where we have massive particle accelerators that SMASH ELECTRONS TOGETHER, where we have the technology to CREATE ARTIFICIAL LIFE, and the technology (which is now outdated by HALF A CENTURY) to destroy all life in a large area. Mouretsu Pirates just doesn’t make sense! If you’ve got people colonizing different star systems, they have to have had the TECHNOLOGY to colonize these things! But they obviously don’t, because if they did they wouldn’t be going around in cars and bikes, using tractors to plow their fields and sitting in fixed classrooms in desks. We have that all today. Humanity’s not going to nothing for a thousand years. Uh, don’t bother reading that post. I just had to say stuff. That’s okay, I’m gonna respond anyway. Mushy, I disagree with your thesis. I’ll get around to where I agree with you, but I believe you are overstating the changes that should have happened in the future, and are underestimating the amount of change that we might be seeing. A good example of the former is your idea that we won’t have final exams in the future. Maybe, but I don’t know why we should believe this is necessarily so. The exact way that final exams are proctored is bound to change, but I don’t know why they would cease to exist. Another example that I think straddles the two categories is your assertion that we won’t have bicycles in the future. The first thing I would point out here is that people have been riding commercial bicycles for 200 years already. Now supporting technologies have changed (for example materials science has changed quite a bit, the bicycles sold in 1818 were made of wood). In other words, just because we see something in B-Space Pirates that looks like something we use today, doesn’t mean that refinement didn’t occur. It just means that the underlying concept (a human-powered transportation device featuring a frame balanced across two wheels) still has relevance to the human race in the future. Just one more counter-example before I start agreeing with you: You said that the hackers that attacked the Odette II were repelled by a commercially available ant-virus system, but that isn’t what happened, from what I saw. The system that repelled the attackers was an “electronic warfare system” that seems to date from the time the ship was in use for military purposes. It is clear that it is a military-grade electronic warfare system because they overload the power couplers in the space port when they run it. Also, you complain about Marika and Chiaki not having to do anything to run it, but then you complain about how we should see signs of Artificial Intelligence — certainly this is inconsistent. The EWS is able to act largely autonomously once it has been enabled, that is a practical demonstration of Artificial Intelligence (at least one definition). Now I also wonder alongside you about what they are saying in this show about the technology curve. It seems that, unlike current expectations, the curve is being shown as flattening out. Even if we assume continuous upgrades and maintenance it is odd to think of not one, but two, century old space ships. In our world an iPad seems old in a year, and we want to replace it with the next thing. 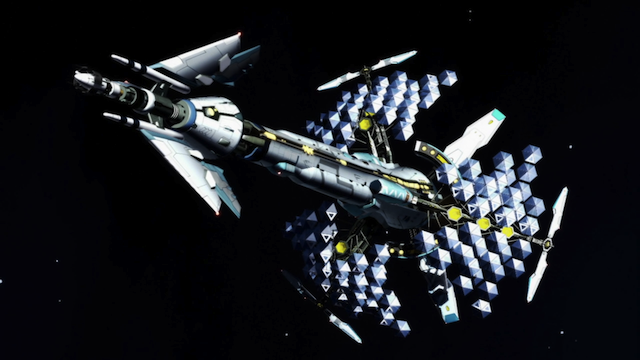 Somehow in the world of B-Space Pirates technology changes slowly enough that people will keep the same space ship flying for over a hundred years. I’m not convinced that that is definitely the way the future would be, but one has to admit that there are really only two sensible futures ahead of us: one in which the technology curve flattens (like B-Space Pirates) or something unimaginable (the Singularity). Humans have a long history of favoring cultural continuity. People still drink out of cups that are more or less like what our ancestors drank from thousands of years ago. The last 50 years, or so has been a bizarre anomaly with certain technologies being replaced at an ever-increasing rate. If you want to argue that technology will continue to advance in that way, I won’t disagree, because I don’t know what will happen, but it does mean that you can’t tell stories about the humans of the future, since they don’t really exist “beyond the event horizon”. It may not be true that the technology curve will eventually flatten out, but it is the only thing that makes story-telling about humans in the future possible. Joojoobees — you beat me to the point about the software (see post below)! The only point I’ll add to what you said is that the Odette II is referred to as a bit of a history piece, and relegated to a high school club. I doubt if most of the ships in general usage are a century old. And the girls did make the comment about how much more quickly a modern ship would make the Tau Ceti run. I’ll just add a bit about the EWS (electronic warfare suite) and the sensor and navigation suite, as well as the computer systems overall. They are absolutely top-notch, apparently. Even Kane, an experienced space pirate, is totally shocked at what he sees when he powers up the sensor suite. He even comments that it’s ridiculously over-powered, and notes that it’s more fitting for a Fleet flag-ship than a retired pirate ship/high school club yacht. And to clarify, a flagship’s computer systems have to be both very powerful (well above a ‘normal’ single ship’s capability) and very good. Why? Because it’ll be taking in and processing data from an entire fleet of ships, not just it’s own sensors. It needs to be able to keep track of the entire battle field, in real-time. That’s a tremendous amount of data to process. As for the hacking, the ones doing the hacking were expecting to find a yacht with minimal protections. Instead they got a military-grade anti-hacking system with aggressive capabilities and the resources of a fleet flagship. It’s also noted that while they were experienced, they weren’t actually all that good. But putting that aside: Has anyone found a good sized picture of the Odette II? Because I really, really want it for my background. That is one incredibly beautiful ship and I want it, badly. Uldi, thanks for your comments. To get straight to your question, I think you have to pick what is most important to you. There are some shots of the whole ship with solar sails unfurled, but they tend to be at a distance, so you can’tt see much detail on the ship. There was a good fly-by shot of the Odette II, in episode 4, which means you can see more detail on the ship, but some parts of the ship get cropped out as a result. That makes sense; ultimately, just like how Steins;Gate was more a romance/psychological show than a science fiction show, I think Bodacious Space Pirates will prove to be more about human interactions than actual science fiction. Another possibility is that star travel to those stars took centuries, and so their current technology is centuries older than the ‘current’ technology on Earth (but that point is null after episode… 3’s narration? About going to space not being a one-way trip). Perhaps we can’t apply generalizations about our current society to any point in the future, much less a few thousand years. Maybe a nuclear war occurred! Who knows. I do hope we get more information about the nature of space travel as it works in the show. Perhaps upcoming episodes on the Bentenmaru will give them an opportunity to discuss this matter. I’m just going to address your first comment. I think the implication was clear that the ship’s automatic hacker defenses were anything BUT normal. The two girls were clearly surprised at the autonomy and effectiveness of the system. This ties into the history of the ship as a privateer and the fact that there’s a lot going on here beneath the surface. It’s almost certain that there’s some type of ongoing cooperation between the government of the planet and the remaining privateers, and it’s very likely that this two-hundred year old ship has some very up-to-date components about it. Remember how the one hacker girl said there was still a lot about the computer systems she didn’t understand? That would certainly not be the case if the ship’s systems were antiques. Title to the contrary, this is a show that’s got some bones to it. Ya need to look beneath the skin here. Well, at episode 4, it is a little tough to say what else is going on. I think I’ll refrain from further comment until we have more material to parse. What? Abstain from wild-eyed-speculation ahead of any reasonable basis? Surely you jest! Where would Climate Science be if we all behaved that way?